Shown are, front row from left: Hazel Jolliff, Cheyenne Skaggs, Brooke Clapham, Mikaela Osborne, Alexis Brook-Hobbs. Back row: returning officers Grace Struck, Isabelle Crum, Brydon Ratliff, Liam Warren, Tess Ruehrmund, Camrie Meyers. Cardington FFA members in front of the Florida theatre where they attended the Comedy Show. Every year Cardington FFA Chapter members have the opportunity to run for a chapter office. Each potential officer goes through an extensive process that determines who fills the 11 officer slots for the year. The process includes a writing section, a speech and interview and a chapter ballot vote. 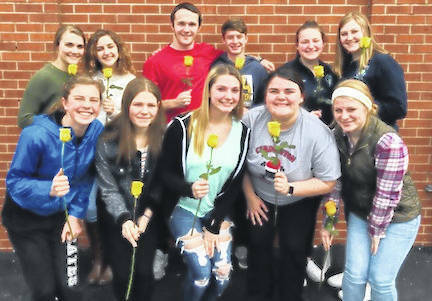 The new Cardington FFA Chapter officers were tapped on March 21 by the senior retiring officers. They are Hazel Joliff, Cheyenne Skaggs, Alexis Brook-Hobbs, Brooke Clapham and Mikaela Osborne. Returning team officers are Isabelle Crum, Camrie Meyers, Tess Ruehrmund, Brydon Ratliff, Grace Struck and Liam Warren. These officers are excited about the coming year and will learn their positions on the team during the spring banquet April 5. Cardington FFA juniors and seniors enjoyed the week of March 13 in Florida. They began their trip on Wednesday, March 13, with the flight boarded at 4:40 am. Landing in Orlando, they went to Cocoa Beach where they spent the day. Later that evening they visited WonderWorks and saw a comedy show. They spent the next day at EPCOT and on Friday they split the day between visiting Universal Studios and Disney Springs. A visit to Sea World was on tap for the last day where they spent the day. During the past few weeks, the Cardington FFA competed in the Mount Gilead, Marysville, Miami Trace, Wilmington, Ashland and State Invitational. Cardington chapter had teams competing in the General Livestock, Wildlife and Nature Interpretation, Equine, Dairy Foods and poultry judging. The General Livestock team was comprised of Emma Burchett, Jacob Levering, Isabelle Wickline, Jadine Mills, Dylan Goodman, Maci Morgan, Kiersen George, Liam Warren, Grace Struck, Josh Shook, Katie Lester, Jacelyn Mills, Kyle Snyder, Connor Shinaberry, Sydnie Wilson, Christian Hand, Heather Sparkman and Zoie Bagwell. The Wildlife and Nature Interpretations Team members were Tess Ruehrmund, Gabe McConnell, Isabelle Crum, Trey Brininger, Josh Brown, Alexis Brook-Hobbs, Beth Hardwick and Bryce Moodispaugh. Equine team members were Hailee Edgell, Brooke Clapham, Kayla Carlyle, Brandon Miller, Jeffrey Barker, Jack Allen, Tess Ruehrmund, Owen Christian and Drew Etgen. Dairy Foods team members were Tess Ruehrmund, Audrey Brininger, Dana Congrove, Alexis Crone, Jade Delawder, Ayden Plowman, Marcella Rollins, Jenna Debord, Addison Plowman, Ashton Plowman, and Michaela Rowland. Tess Ruehrmund, Liam Warren, Madeline Franks and Brydon Ratliff comprised the poultry team. The teams each placed very well.